This is a game that will have an impact on the final shakedown of the Euroleague playoff games as the away team is in the running to grab fourth spot and that final home-court advantage position. The Greeks know that a win gives them the position they are desperate to grab and even though there is comfort to take from the fact that results in other games could see Panathinaikos get what they want even if they fail to do the business themselves, teams like to have things in their own hands. This is a game between two sides that know each other very well and this will be the 20th time that these sides have met in the Euroleague. There isn’t much between the historical records of the teams and it is the Israeli squad that holds a 10-9 advantage heading into this game. 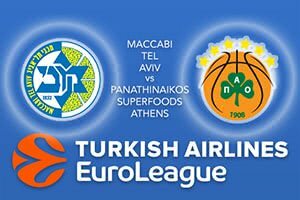 The previous clash of these teams saw Panathinaikos win in Greece with the final score coming out at 83-75. This was a huge night for Chris Singleton who offered up 26 points, and if the Greek players can match that level of performance in this game, there is a very good chance that they will be celebrating at the end of this match. It has been a difficult season for Maccabi and you get the feeling they’ll be glad to get the season over and done with. Victor Rudd has been a key player, offering 9.8 points per game and Devin Smith has offered an average of 9.5 points per game. There is hope for next season with the fact that Diamon Simpson has only played five times so far this season but he has offered up 10 points per game. The Greeks have a great defensive record but they also have players that can grab points, including Mike James with an average of 12.7 points per game while Singleton has notched an average of 12.2 points per game. KC Rivers has also played his part, offering an average of 11.1 points per game. This is a game that should mean more to the away side so back Panathinaikos Superfoods Athens at -6, which is provided at odds of 1.90. If you’re looking for the Over/Under market, go OVER 154.5 at odds of 1.90. Bet Now!